This attraction is worth a visit! Open since Spring 2017, its a really lovely family experience. Orbi is an attraction like no other in Dubai. Fusing SEGA’s innovation in the world of entertainment with BBC Earth’s groundbreaking natural history content, Orbi will put you at the heart of nature. Last weekend, I took the girls with some friends to Orbi, located in Magic Planet Midriff City Centre for an educational and fun play date. Total success, we all loved it! Could not take many photos and none of my shots would do justice to the great set up and exciting experience. Orbi consists of twelve different nature zones designed to create experiences that would be impossible in the real world like being placed in the centre of an elephant migration. It's a great encounter with Nature's beauty and power. An educational adventure for children and the whole family, thanks to fantastic technology. The centrepiece of the attraction is the Earth Theatre, a 40metre-wide screen with a powerful 3D sound system where the natural world comes to life through state of the art technologies including fog, vibratory sensations and fragrances. We watched the vast landscapes of Yellowstone National Park, 20 minutes documentary made by BBC Earth films. Total surreal beauty, we all enjoyed the experience. Other attractions include "Mountain gorilla in 4D" , Merging 3D film with a special effect 4D experience, guests are transported to a BBC Earth location shoot with mountain gorillas helping you truly understand what it takes to film in the natural world. One of my favourite experience at Orbi. You get to understand the behind the scene and learn about gorilla behaviour. Super interesting. “African Elephants”, Encounter African elephants in their natural habitat. Migrate with them and experience how these huge mammals survive in the harsh nature of the African continent. Feel the vibration of their stamping feet as you are taken on a virtual African journey into the wilderness. Josefin being 3 years old was slightly frightened but also very excited and intrigued by the experience. "Frozen Kenya" experience the chilling temperatures of Mount Kenya at -25°C! By combining a variety of modern technologies including thermal images, Orbi Dubai will take you on an unforgettable Kenyan experience. You will get to experience the exhilaration of a temperature change that is sure to exhilarate kids and adults alike. Again with strong and loud wind blowing, Josefin did not enjoy the experience... but only 10 seconds. Older kids were more impresses! "Earth Palette" A near 360 visual treat. Stand in the middle of this spacious zone and engage with a wealth of natural images in a spectrum of colours projected around the surrounding screen. It's a lovely interactive experience, all the children enjoyed. Beautiful imagery to please everyone. There is more to see and learn, we recommend paying a visit to Orbi. The current attractions are beautiful, powerful and will delight all nature lovers. The Orbi concept is coming from Japan with it's cutting edge technology. It's a game-changing entertainment experience that will plunge visitors into the heart of the natural world through a visceral, multi-sensory edutainment experience.“Orbi truly represents the next generation of edutainment,” says Damien Latham, Majid Al Futtaim Leisure and Entertainment chief executive officer. Looking for something to do this weekend with the family? 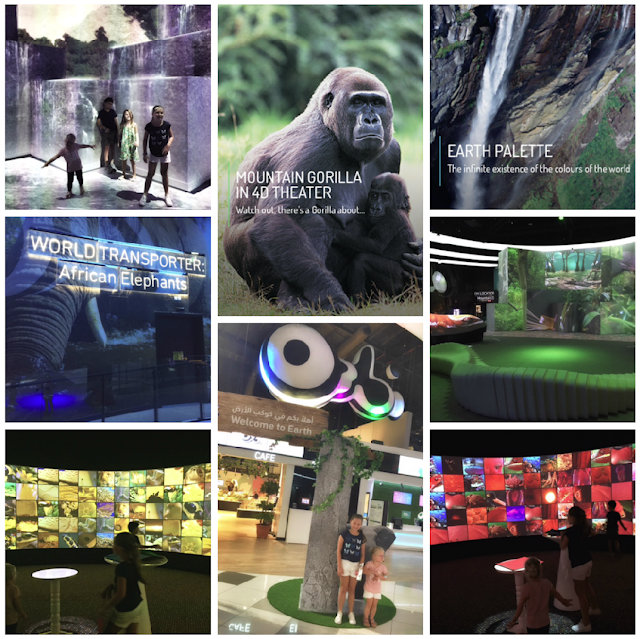 While its still hot outside, we suggest a fun and engaging visit to Orbi Dubai. Fantastic way to learn about animals and the environment.